What exactly should Harrogate Town expect from Saturday's National League trip to Chesterfield? Ten places may separate Simon Weaver's team (9th) and the Spireites (19th), though it's not likely there will be that much between the two sides out on the field this weekend. 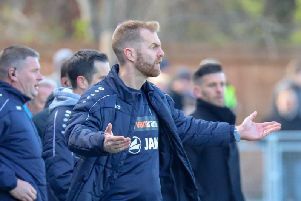 Although Town are still very much in the hunt for promotion and topped the table during the early part of the campaign while Chesterfield have been struggling at the wrong end of English football's fifth tier, the Derbyshire outfit have suffered just one more league defeat (10) than Saturday's visitors to the Proact Stadium. In stark contrast to the men from Wetherby Road, the Spireites don't score too many, but they're pretty miserly at the back. Indeed, since the return of John Sheridan as manager they've been in fine form, winning three and drawing one in the league, without conceding a single goal. Needless to say, the ex-Sheffield Wednesday and Leeds United midfielder has made a huge impact already, but how has he done so? Graham Smyth, the reporter who has covered Chesterfield for the Derbyshire Times and Sheffield Star for a number of years and watches the club week in, week out, offered this insight. "Sheridan has changed the style of play, and Chesterfield appear to be quite well suited to playing it on the deck," he said. "The introduction of Scott Boden up front has given them a more potent looking attack, while youngsters Josef Yarney [Newcastle United] and Ellis Chapman [Lincoln City] have settled in very quickly to add balance and allow the use of a 3-5-2 formation. "They look very solid defensively and have become a side who look to pass it, get it wide and get balls into the box. "Chapman and Lee Shaw provide the width as wing-backs, although they're a central midfielder and a striker respectively. "They've set up in a 3-5-2 formation for the last two games." The biggest threat to Town's hopes of leaving the Proact with three points will probably come in the shape of a Chesterfield rearguard that has been in no mood to give anything away in recent weeks. And although Sheridan's team isn't one blessed with goals, they do still possess some more-than-useful options. in the forward positions. "Scott Boden is a fox in the box, [ex-Premier League striker] Marc-Antoine Fortune has seven goals in 14 league starts and Lee Shaw is a menace who doesn't stop running," Smyth added. "On the bench in recent games has been 6ft 7ins targetman Tom Denton, who most National League clubs have struggled to deal with at one stage or another."